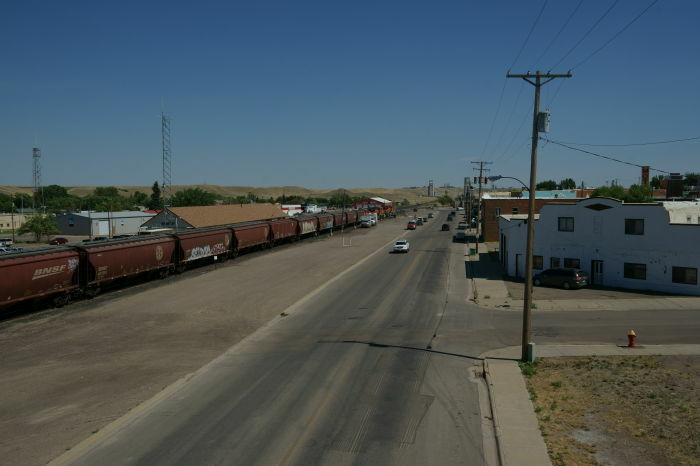 Compared to most of the other towns on the Hi-Line, Shelby, Montana feels absolutely huge. In reality, it is not — the population is just below 3,400 people as of 2010. But in comparison to the miles and miles of empty land in every direction, Shelby demands some of your time and immediately tempts you to stop and explore. And, thanks to the presence of Interstate 15, you have the option of bailing out from the Hi-Line and heading in a different direction. 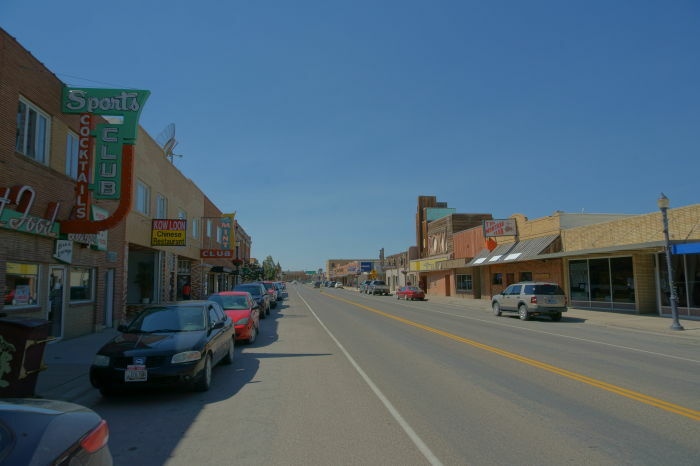 Shelby is located at the crossroads of US 2 and Interstate 15, in north-central Montana. Canada is about 35 miles away, and Glacier National Park’s Going-to-the-Sun Road is about 85 miles to the west. … and an overpass allows you to cross over the tracks to the neighborhood on the north side. 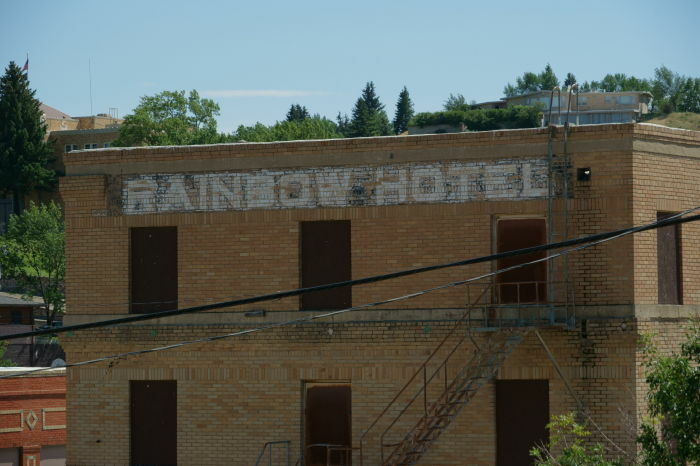 That overpass also gives you an alternative view of downtown — the old Rainbow Hotel stands out amongst the other buildings. 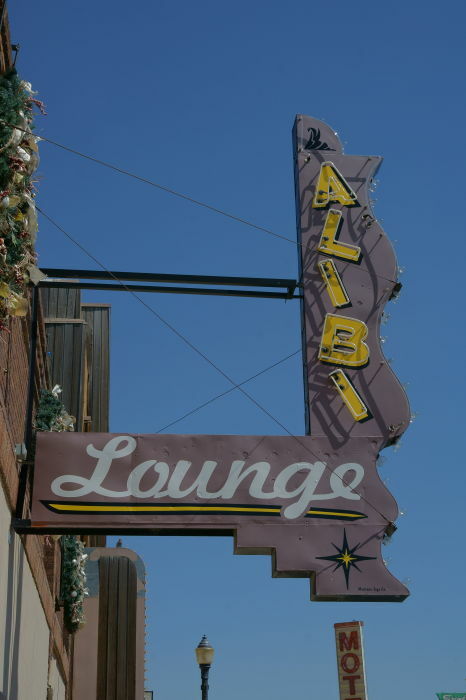 … you’re going to see a lot of great, old neon signs, like this one for the Alibi Lounge. 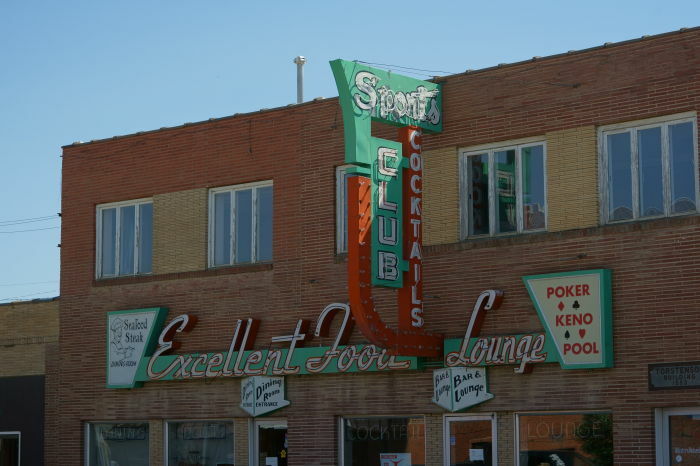 I don’t think the Sports Club is currently open, which is a shame because I’d love to see all that neon turned on. 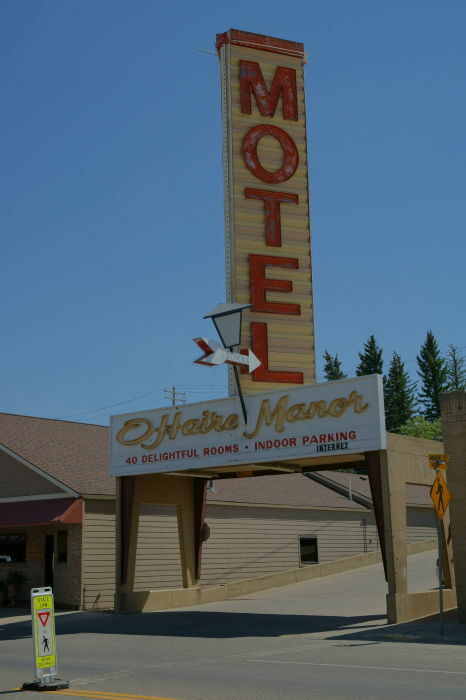 If there’s one sign on Shelby, Montana’s Main Street that’s over-the-top, it’s this giant neon motel sign, for the O’Haire Manor Motel, two blocks up the hill. 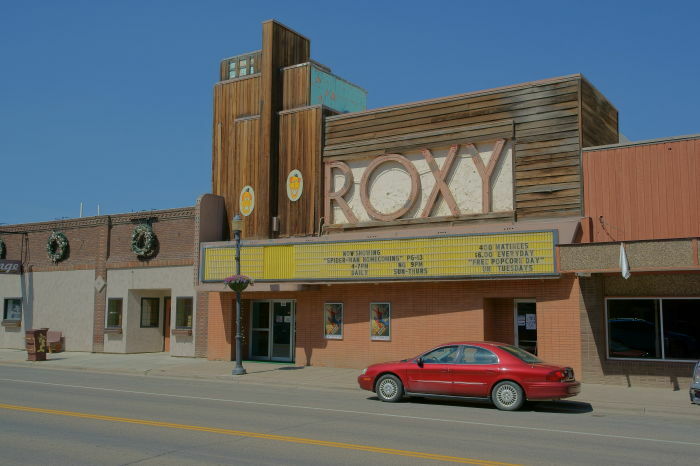 The Roxy Cinema has been here since around 1936, and is still showing movies. The Rainbow Conoco station was also built in 1936. I didn’t know much about it when I visited, but Google Maps marked it as a historic location, so I took a picture. 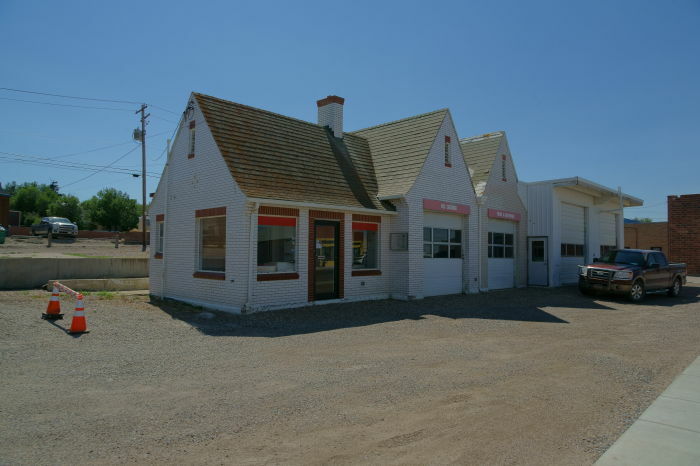 Now I’ve read that the old Conoco station is on the National Register of Historic Places, recognized as one of the finest examples of a 1930’s gas station in Montana. It would be great if someone would tear down the ugly addition on the far end of the building, and restore the place to its former glory. On the way out of town, US 2 crosses the railroad tracks, and of course, I had to stop for a train — giving me a few extra minutes in Shelby, before continuing my journey east. After experiencing the small towns and empty spaces along the Hi-Line, Shelby will feel like a very big place. Take a few minutes to walk around and appreciate this transportation hub — and fill up your tank and your cooler, because it’s a long way to wherever you’re going.